You can access the Play Store through your Galaxy S6 phone’s Play Store app or through the Internet. The easiest way to access the Play Store is through the Play Store app on your Galaxy S6 phone. The icon is shown here. 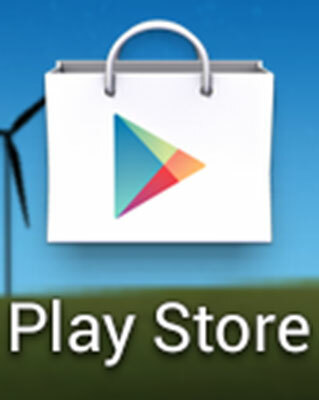 If the Play Store app isn’t already on your Home screen, you can find it in your Apps list. To open it, simply tap the icon. When you tap the Play Store icon, you’re greeted by the screen shown here. The Play Store Home screen. Apps: This showcase highlights valuable apps or games that you might not otherwise come across. Apps is the first Play Store category you see (the leftmost screen on the panorama). Games: These apps are for fun and enjoyment. As it happens, games are the most-downloaded type of app. The popularity of any given game is a good initial indication that it is worth considering. 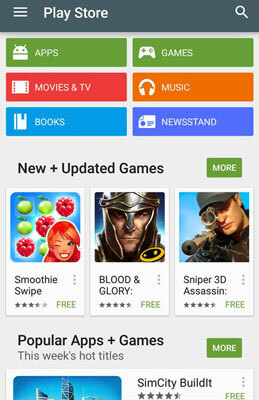 Apps refer to games and other kinds of apps. Some purists make a distinction between apps and games. The thing is, from the perspective of a phone user, they’re the same: You download an app and use it, whether for fun or to be more productive. Movies and TV: As with music, you can download multimedia files and view your favorite movies and TV shows. You can watch these on your Galaxy S6’s screen. Books: Have you been thinking about getting an e-reader, such as a Nook or a Kindle? Before you spend your hard-earned cash, take a look at the book library here and see whether you like reading on your phone! If you like the way the Nook or the Kindle work, both are available as apps you can download and use to access your accounts on the Barnes & Noble website or Amazon.com. Newsstand: Same idea as with books, only this category is for periodicals.